Thanks to funding from the Bay Area Air Quality Management District’s Transportation Fund for Clean Air, San Leandro businesses and property owners now have access to new assistance to install Electric Vehicle (EV) charging stations at their commercial, industrial and multi-family properties. The Bay Area Air Quality Management District (BAAQMD) has just released the 2017 Charge! 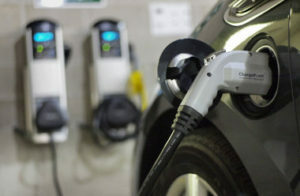 Program, offering grant funding to offset the cost of purchasing, installing, and operating new publicly available EV charging stations at qualifying facilities. The goal of the Charge! Program is to rapidly expand access to EV charging stations in order to accelerate the Bay Area’s adoption of EVs. Wednesday, April 12, 2017, 1:30 PM – 2:30 PM (Register) New addition! Wednesday, April 26, 2017, 10:30 AM – 11:30 AM (Register) New addition! San Leandro sites located within the I-880 corridor have additional incentives through this program and through the PG&E EV Deployment Program.